The posters, ahead of the opposition protest in Delhi, feature caricatures of Mamata Banerjee in her trademark white saree with a blue border. Several posters taking a swipe at Mamata Banerjee cropped up in Delhi ahead of the opposition sit-in. 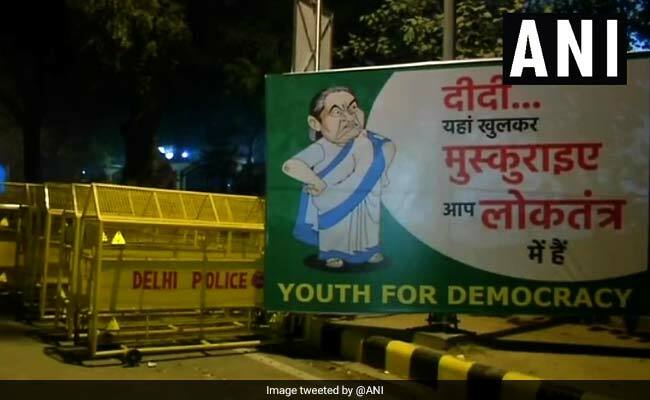 As Mamata Banerjee landed in Delhi last night to participate in a massive sit-in today by the opposition leaders, huge hoardings cropped up in central Delhi, "welcoming" the firebrand politician from West Bengal. 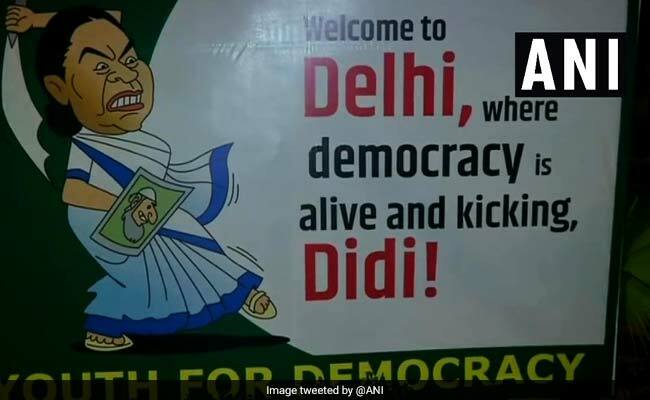 "Welcome to Delhi, where democracy is alive and kicking, Didi!" reads one of the hoardings, showing Ms Banerjee walking angrily, holding a picture of the beared, skull cap-wearing man. The posters feature caricatures of Ms Banerjee in her trademark white saree with a blue border. A number of such posters have been installed at many places in the capital, taking a swipe at Mamata Banerjee ahead of her joining the sit-in with leaders like Delhi Chief Minister Arvind Kejrwal and Andhra Pradesh Chief Minister N Chandrababu Naidu at Jantar Mantar this afternoon. Posters on Mamata Banerjee cropped up in central Delhi. "Didi, smile openly here. You are in a democracy," reads another one. 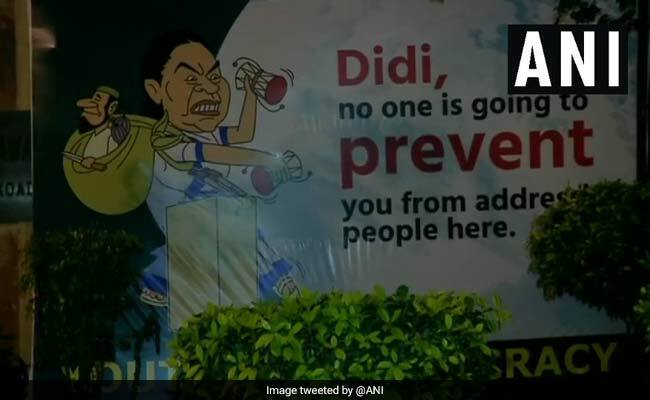 "Didi, no one is going to prevent you from addressing people", reads the caption of another poster (pun intended), showing her with a cloth bag on her shoulder - a skull cap-wearing man in it. She is also shown holding two dhols. The Mamata Banerjee posters were put up "welcoming" her to Delhi. 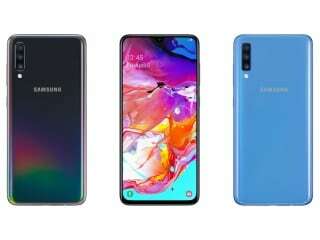 This one in particular holds significance as tension between the BJP and Mamata Banerjee's Trinamool Congress in West Bengal rose after her party refused to grant permission to senior BJP leaders to hold rallies in the state. The chief minister repeatedly denied permission for their helicopters to land at the rally grounds. The BJP has termed this move "undemocratic". Holding an election rally is the constitutional right of every political party, they had said. Today's protest in Delhi - hosted by Arvind Kejriwal - is the second one in three weeks after Mamata Banerjee hosted 20-odd opposition parties at her Mahagathbandhan (grand alliance) rally in Kolkata on January 19. The sit-in is being loosely labelled "Mahagathbandhan2.0". Almost all the leaders who attended the Kolkata rally are likely to be at Jantar Mantar today. Former prime minister HD Deve Gowda is in New Delhi; so is Nationalist Congress Party chief Sharad Pawar, his party colleague Praful Patel, DMK's Kanimozhi and National Conference leaders. 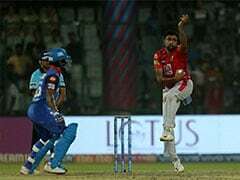 Bihar leader Tejashwi Yadav is unwell. There is uncertainty over the Congress's attendance. While Abhishek Manu Singhvi and Mallikarjun Kharge had represented the party in Kolkata, the fact that the Delhi platform is being hosted by Mr Kejriwal is a sticky point. "Narendra Modi knows he is not coming to power. His expiry date is over. Within 15 days, we will have election dates. We want to see a new government, the country wants a change, the country wants to see a united India, where democracy and inclusiveness will be sustained," Ms Banerjee said in Kolkata yesterday, before she left for New Delhi.